I’m back from the honeymoon. I had a great time and will talk a bit more about that here in the next couple of weeks as I get over my jet lag. That’s a real thing. I was a zombie by 4pm last night and fought to stay awake until 9pm and then woke up at 1am ready to get up and go to work…. SMH. 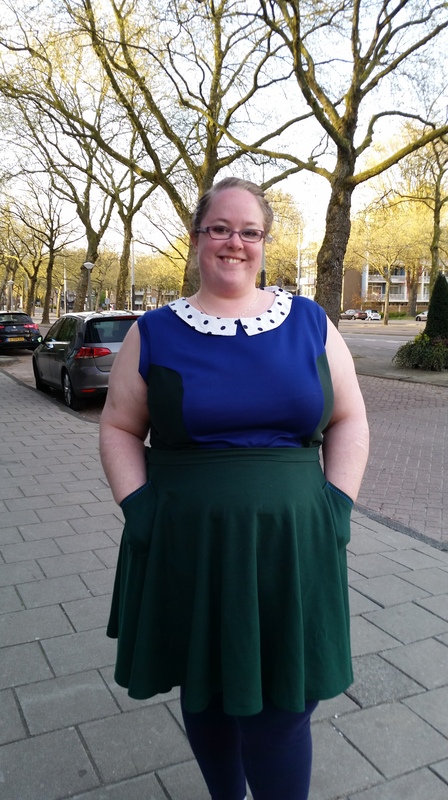 Before I left, I tested a pattern for Muse Patterns: the Philippa dress, top, and skirt. Dress and top can have cap sleeves or be sleeveless. As with most Muse Patterns, the pattern is very versatile and can be customized for several different types of garments and different looks. Philippa also has the added bonus of different types of fabric. It can be made in light-medium weight for the top, medium to heavy weight for the skirt, and in either for the dress, depending on whether you include pockets. You can also use a stable ponte or mix and match with ponte side panels and woven in the front. It’s a 1960s mod-inspired look with princess seams on the front and back. The sizing is a bit different for this one as you choose your size based on your high bust. I chose to make the top out of ponte because it was right before I left and I knew I could whip it up fast on my serger. I made it with blue ponte on the front and green on the side. I used polkadot rayon fabric for the collar. I left the zipper off as the ponte had a slight stretch to it making it easy to get over my head. 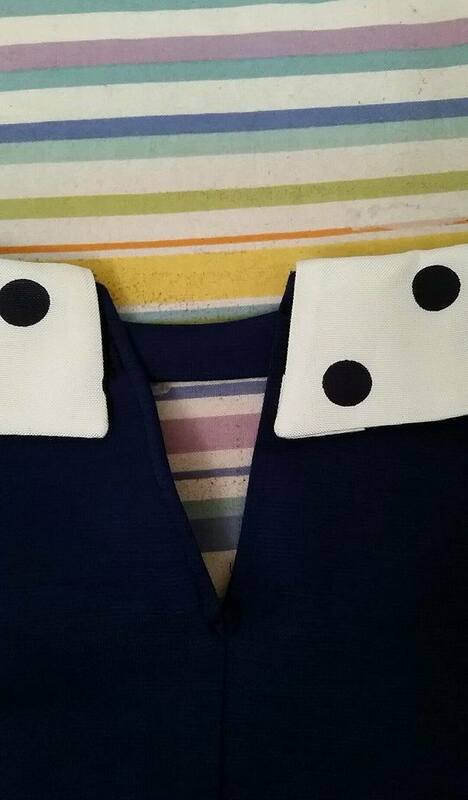 I also made a triangle peakaboo detail at the back with a small band of fabric across to join the collar. I love the detail. Sizing was spot on. I was a little concerned about the size since my middle has gained a couple of inches since the fall and I’m a bit above the size range in that area now, but there was no issue with the top, except that I do prefer longer tops. So I will be lengthening it in the future. I think with the dress I would grade out at the waist a bit in a woven material. Here is a mirror picture showing the length of the top. Excuse the leggings as pants look. Like all Muse Patterns, the instructions are detailed and easy to follow. The patterns are drafted really well and all the notches match perfectly. I will be making the top again in the future and making a muslin of the dress. 1960s mod-inspired dress isn’t really my style, but I adore this one. Instead of the basic shift dress, the princess seams and style lines really give this dress more shape and interest than the basic mod-inspired dress. The collar is so awesome, too. It’s so cute. Since the skirt is an A-line skirt, I probably won’t be making it. I don’t think the A-line shape looks great on me in a skirt. You never know, though! It does have pockets! I love the way the top looks with my green Pavlova skirt. Instead of finishing the arms with bias binding, I used a narrow band for this version. I won’t put in a review for this as this is the test pattern. When I sew it up using the final pattern, I will do a full review. 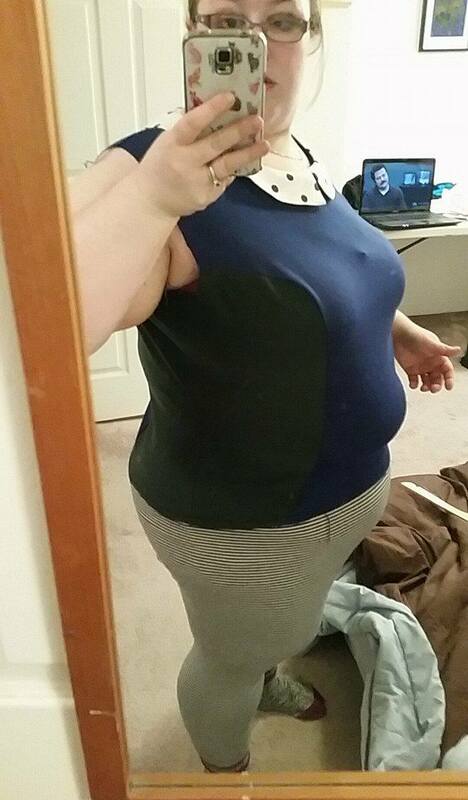 I LOVE the mod look of this top and it looks great on you! Thanks so much, Valerie! I really love it, too. Welcome back! The collar is a cute feature, and I love how it comes together at the back.